20 Days of 20 Years of EMG, Day 20: FREE coloring book and lots of thanks. Nothing new is for sale today; I will be tallying up boxes and sending out invoices with shipping charges (if they apply). This is your last chance to snag some of these fabulous bundles - and I've marked every bundle down even further today - let's move 'em out! 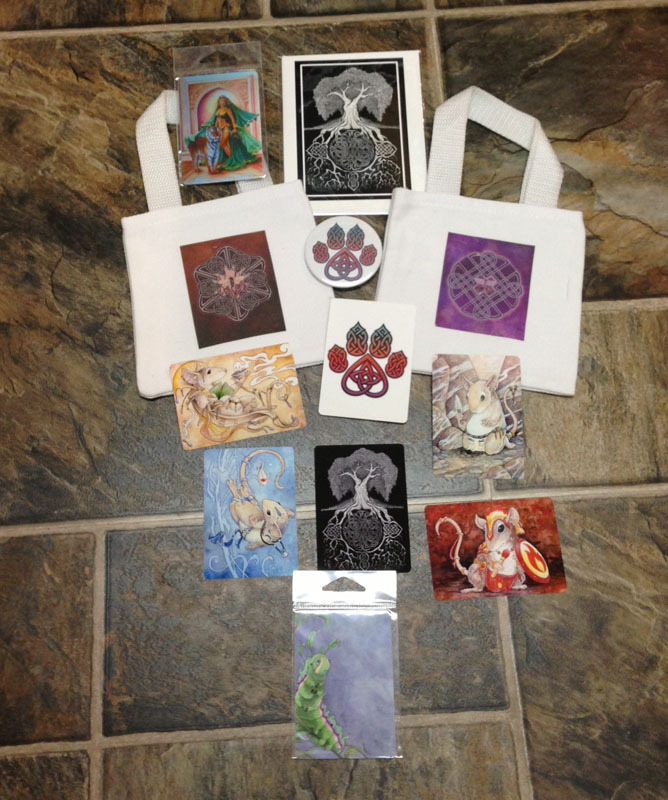 Oracle decks ($10 each), calendars (between $5 and 10/$12), anthology collections ($50 for all three volumes), teas (6 peppermints, 1 oolong, 4 apricot/peach green - $6 each), coloring books (5/$40, 10/$70), and 2 Happy Cthulu pins ($!0) are still left, too! 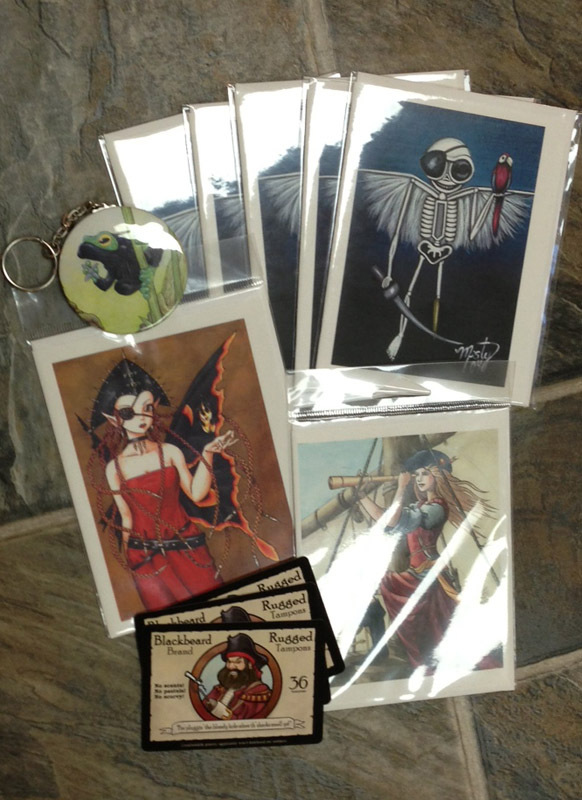 And, I have Fantastrix and Dotminatrix in stock, so I'll be starting the mailing of those, too! Nothing new is for sale, but I do have something free for all of you: a free PDF of the Archivistrix coloring book! Enjoy! Spread the word! Download, print, color, share! It is my gift to you - brought to you by the Kickstarter campaign that funded Fantastrix. It's been a really fun and exiting 20 years of Ellen Million Graphics. From the tremendously humble beginnings in 1993, the business has evolved in directions I never anticipated. I am enormously grateful to all of the people who have made it possible, and thank you from the bottom of my heart. 20 Days of 20 Years of EMG, Day 19: Last bundle! You only have until Thursday to claim any of the remaining specials or bundles! I will be packing things up starting on Friday, and anything unsold at that time will be broken up and spread out across all the boxes I'm packing up. 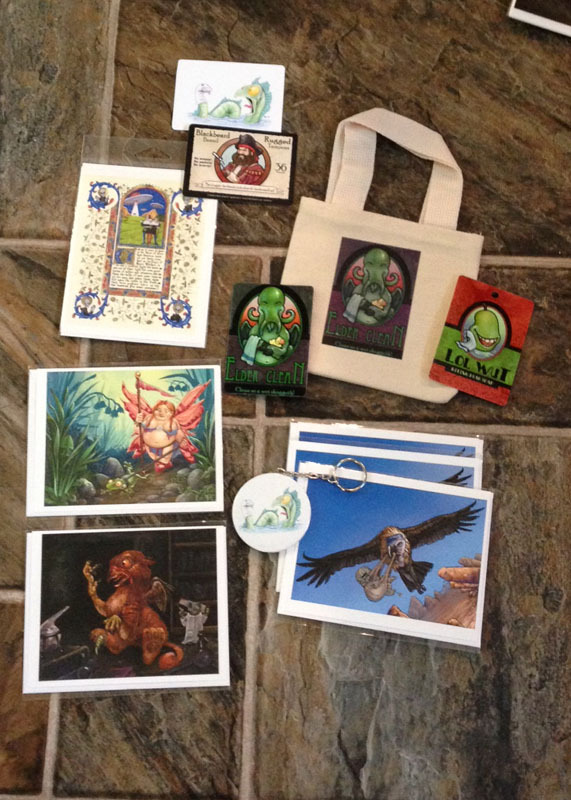 Animal Nouveau Bundle: $10 (1 card, 1 magnet, 7 stickers, 1 button, 2 mini-totes) gone! Don't forget to add portraits (by any artist!) to your wishlists. I will be drawing the winner of a free portrait adoption (from my gallery) on Nov 1! 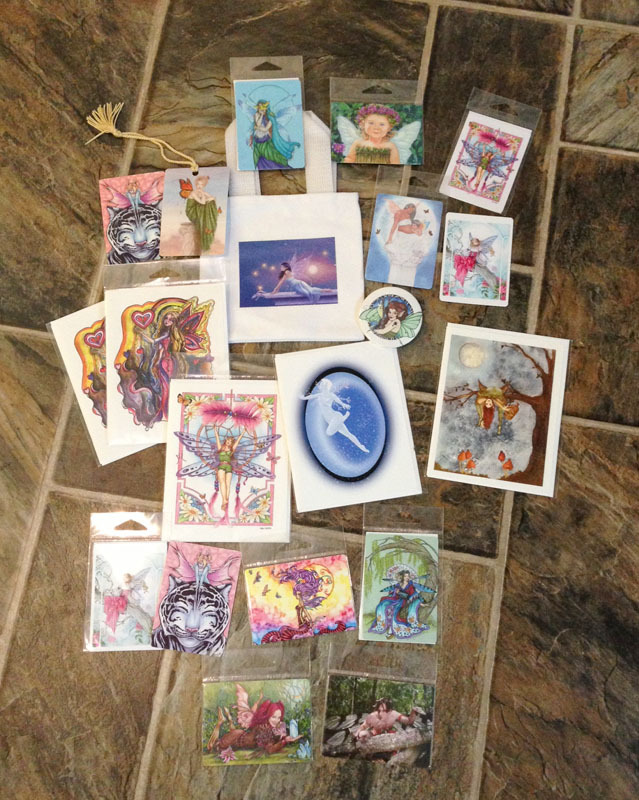 And on that topic, we have a winner for the free ACEO pack from last week. Congratulations to: Isabelle! 20 Days of 20 Years of EMG, Day 17: Two more bundles, and TEA! The teas are high quality pyramid sachets (much, much more like a loose tea than the usual, more powdered, teabags, but so much more convenient! ), 20 to a tin, $6 each. They are a little bulky - I can get 6 in a medium flat rate box (there's no way to make even one fit in anything smaller!). Available flavors: Peppermint (16 14), apricot/peach green tea (16 5 - I never carried these, I was planning to introduce this flavor! SO yummy! ), oolong (3 1) and chai (6 unlabeled, 4 labeled). 20 Days of 20 Years of EMG, Day 16: ACEO blanks and a drawing! I bought a stack cutter and a heavy-grade die punch that cut 2.5 x 3.5, with lovely radiused corners, stocked up on various art papers, and provided oddball kinds of specialty paper that were perfectly cut for art cards. It's a little time-consuming to do the punching, but the radiused corners are really cool looking. I also can do hard corners on my stack-cutter, which is WAY easier, but not quite as awesome. I kept this equipment, and I have some of this stock left! If there is enough interest, I may keep two or three kinds of paper in stock and start offering them generally for sale again. The rest of this stuff I consider leftover, so it's gotta go, too! Unopened pack of 100 sheets, 9.5 x 13 inches. Uncut, $4 - but it's large, so will require a minimum of medium flat rate box. 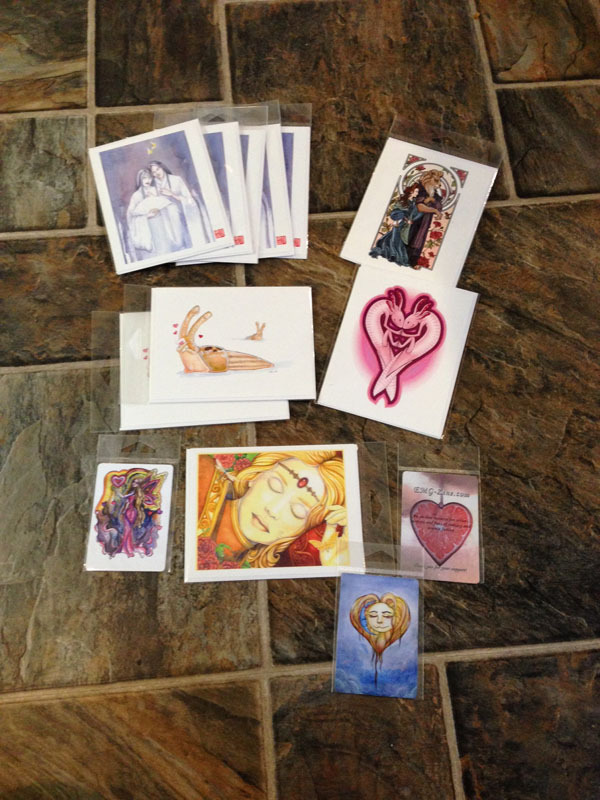 Cut into ACEOs (~900 cards): $15. Punchcut for $35. gone! Strathmore Bristol, 300 series. I have smooth and vellum! 150 cards for $15 cut, $35 punched. I will probably not carry this again, because Strathmore wised up and started offering this size themselves. Arches Hotpress, 140. 50 cards for $15 cut, $30 punched. Arches Coldpress 140. 50 cards for $15 cut, $30 punched. Scratchboard: white, gold or silver: 50 cards, $5 cut. $25 punched. Crazy miscellaneous pack: 100 cards, $10 cut, $35 punched. And... I haven't done a drawing for a while, so anyone who comments here (OR at the Facebook mirror) is entered to win 50 miscellaneous cut blank ACEOs. No purchase necessary. 20 Days of 20 Years of EMG, Day 15: Coloring Book Madness! 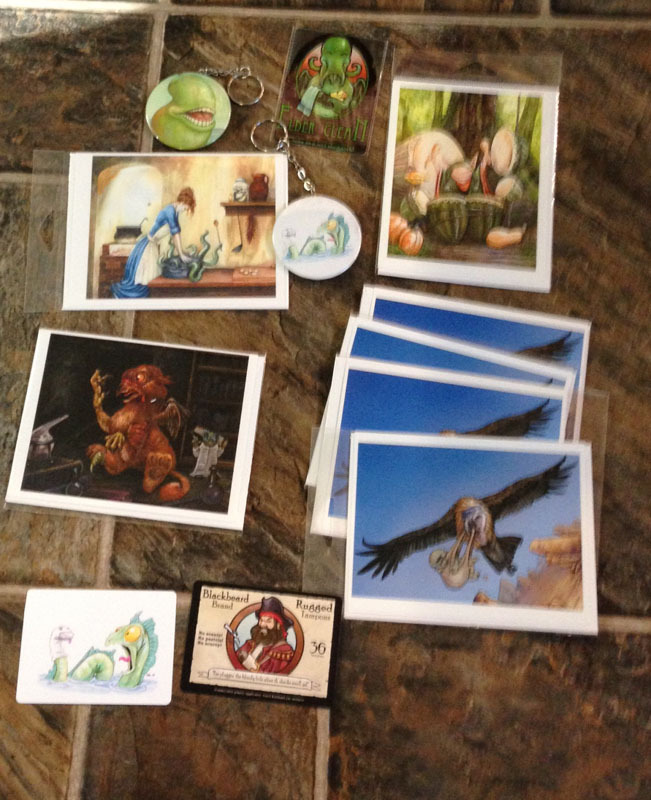 Final print files for Fantastrix are in to the printer, and I should be able to pick them up in the next few days! Horrah! Fantastrix is 28 pages; the largest and most detailed coloring book I've ever put out. It retails at $9.00. I'm officially releasing this title today, and since we're celebrating 20 Years of EMG in crazy, mad style, I'm also offering an amazing coloring book bulk special! Specifically, ANY five titles are just $40, any 10 for just $70! You can order directly at that page, OR, claim your titles with a comment to add them to your box of swag, if you've got one going. Don't wait until the end of the month, though, because some of the titles are in very short supply, and many of them will not be reprinted. I DID find three copies of Rum and Ruffians in a show box, but am only listing them here, not at the order page, since there are so few. Just a brief update today, because... things. More bundles for you today! 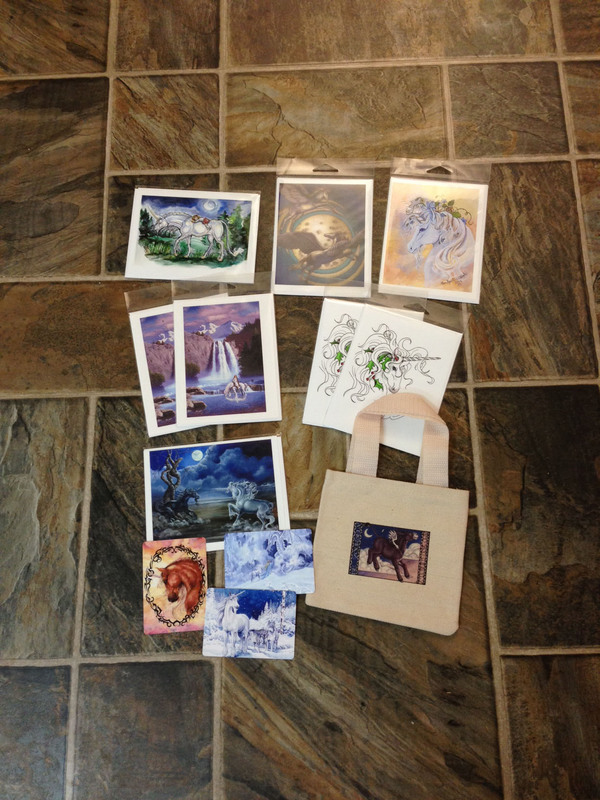 Unicorn Bundle #1: $10 (8 cards, 3 stickers, 1 mini-tote) claimed! 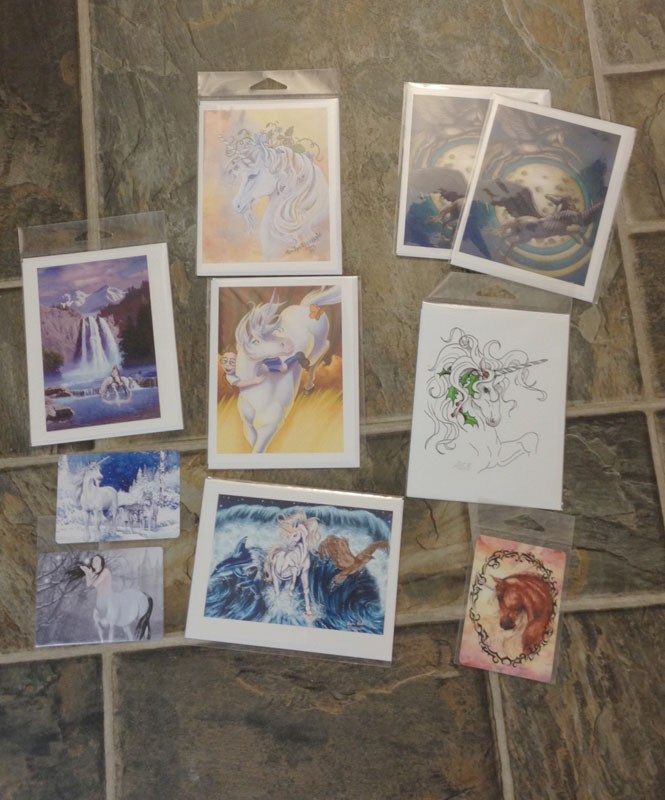 Unicorn Bundle #2: $9 (7 cards, 2 stickers, 1 magnet) claimed! 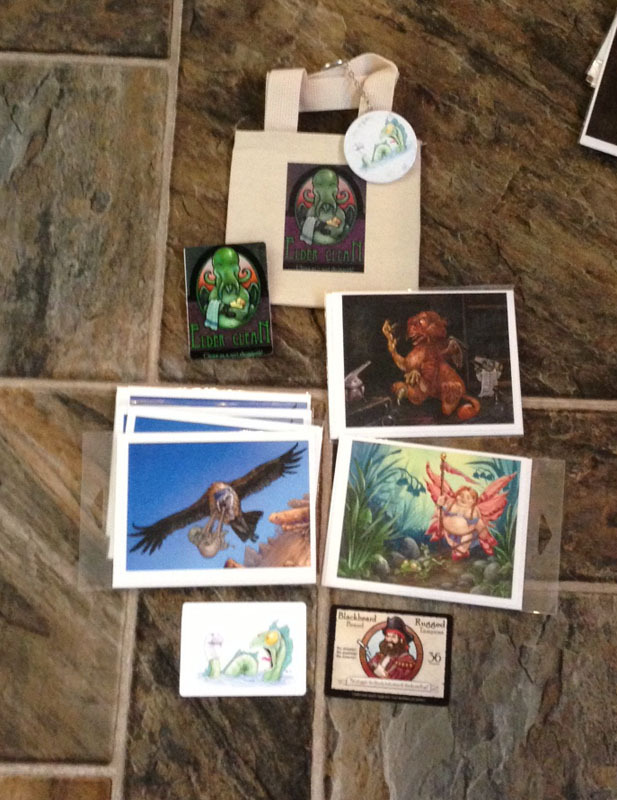 Periodically, I sold awesome things through EMG that I didn't make myself. 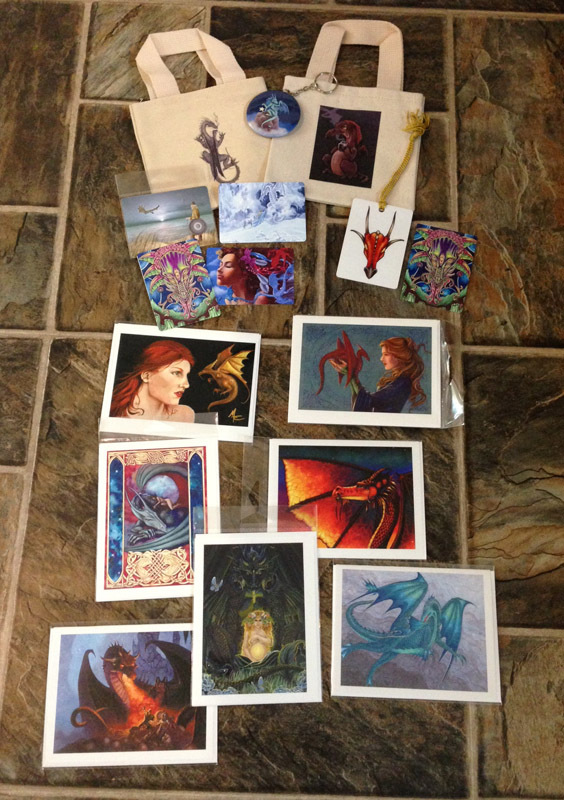 For example, Oracle of the Dragonfae , which included artwork by several of my artists, and Mythic Oracle with artwork by Ravynne Phelan (then Michele-Lee Phelan!). I also carried Wild Wisdom of the Faery Oracle (Book & Cards) and Pathfinders Animal Totem Deck, but both of those are out of stock. Portrait Adoption was the first real step that EMG took away from the original giftshop, and ended up being one of the most successful experiments of the business. The premise of the site is to provide character portraits for gamers and writers who might otherwise commission a portrait... but are perhaps a little cautious about commissioning work from a strange artist. Let's face it, artists can be flaky, and commissioning work can be very disappointing. It's an awesome outlet for artists who like to draw 'random people,' but don't like the pressures of having to work with clients or to deadlines. Portraits are uploaded the site already completed, for 'adoption.' Adoption of a portrait gives the client a large, unwatermarked image of the portrait, and (optionally) a high quality print and a signed certificate naming the portrait to their specification and promising that no other prints will ever be made. The client still gets something one-of-a-kind, but there is none of the usual hassle and headache (and sometimes, heartache!) of the traditional commission process. As the site developed, we added a customization feature - artists can offer to tweak the portrait a little to make it just a little be more like the client was envisioning. And we also added the Submitted Description option. Clients can give the description of their character - along with their price-range and desired size and media - and all of the Portrait Adoption artists have a chance to try their hand at it. No money changes hands unless the client makes an adoption, and if they choose not to, the artist can offer the portrait generally, or remove it from Portrait Adoption altogether and make prints or merchandise to their heart's content. (This icon is an example of that!) Submitted Description portraits have a relatively high rate of adoption! The site has proven popular with art collectors who want something truly unique, as well as gamers and writers. The site has come a long, long way... at first, we had a team of artist volunteers who hand-made all the images for the site (do you guys remember that?! ), and later a brilliant database-driven site was created that automated big, big chunks of the process. It's a few clicks of work for me now, plus printmaking, and my tools are pretty awesomely powerful. I've just finished a big (BIG) security upgrade, and merged the Portrait Adoption customer logins with the overall EMG logins. 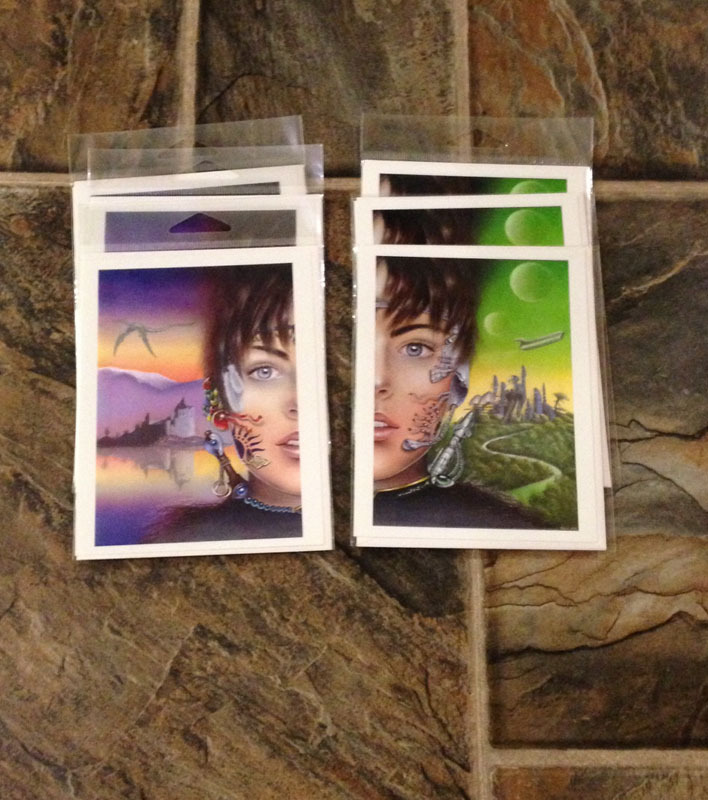 I also gave the portrait pages a bit of a polish and added ACEO as a print option. This is the first step in a planned attack of upgrades that will include (eventually! 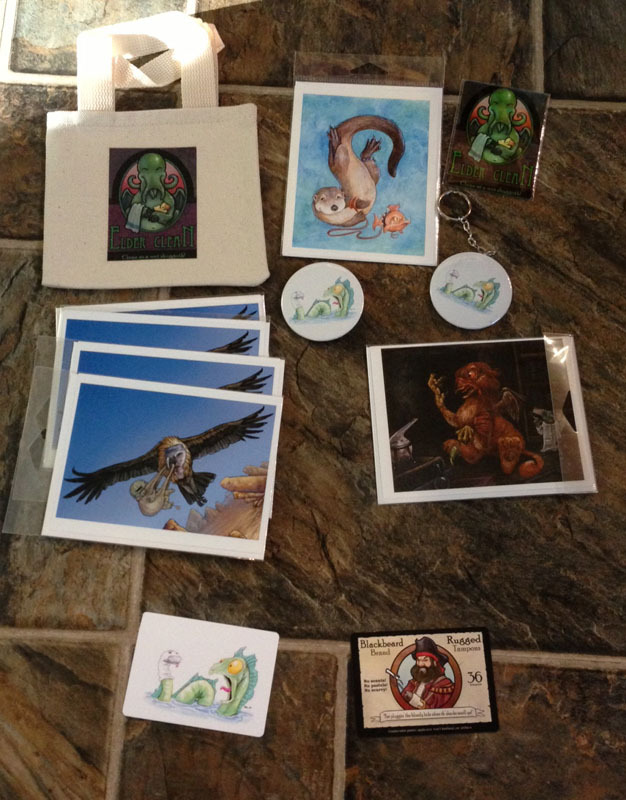 ): auctions, originals, better browsing, more rights management (ebook covers, for example! ), more categories (RPG illustrations that aren't portraits), shared wishlists, better artist tools, and more. SO much more. I've got two amazing specials for you as part of our 20 Days of 20 Years celebration. The first is a free drawing: for every portrait (by any artist) that you add to your wishlist, you are entered in a drawing for a free web adoption of any portrait in my gallery. If you are ordering anything this month (or are a Fantastrix Kickstarter backer with any package that includes shipping! ), you will be upgraded to a standard adoption. To add portraits to your wishlist, log in here and browse through all the gorgeous portraits available! If you have a good high-speed connection, you can see an amazing page with thumbnails of ALL the portraits available (nearly 1000!). The drawing is good on all wishlist additions from this weekend through the end of the month; I'll do the drawing the first of November. Everything you add to your wishlist counts in your favor, so don't be shy about adding them! In any cases where I am shipping you a portrait adoption print, I will upgrade you to the original wherever I still have the original in good shape. Limit 1 per customer the first day they are offered! And in keeping with the theme, a huge, giant thank you to all of the fabulous people who have assisted EMG over the last 20 years. I would list you, but I'm quite sure that I would miss some of you and feel bad later (seriously, BACKWARDS PANTS, people. The brain is not braining right now. ), and also, there is a toddler who doesn't want a nap to wrangle, so please just know that I am incredibly grateful for all the help you've given, whether it's buying my offerings, helping with some of the tedious chores, programming my sites, entrusting me with your artwork, brainstorming ideas, sharing a link, or simply encouraging me at the right time. EMG would have stalled out at a one-page flyer 20 years ago without you. You are all angels. We've got a bonus event going on now! I've gotten 7 very quick sketches done and posted - not sure if I will have time for more or not. Guppy took a short-ish nap today, and though she's not nearly as monster-y as yesterday, I am still a bit short on time. 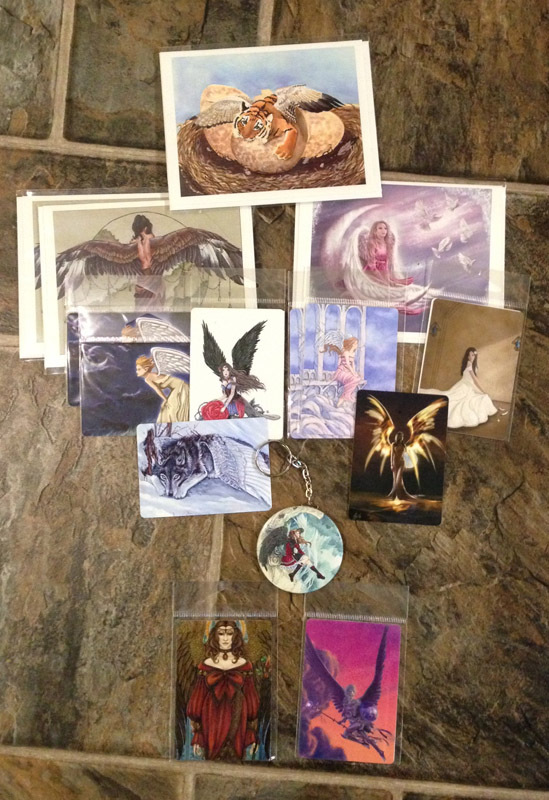 So, today's special will be a FREE ACEO print of any piece (excluding Portrait Adoption pieces!) in my personal gallery at Sketch Fest. 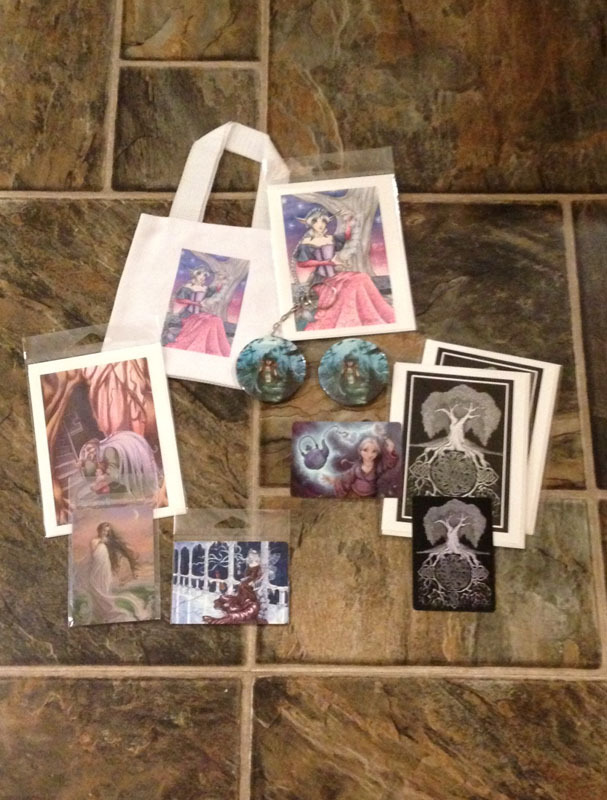 In fact, I will give away four prints - all you have to do to enter is comment here at LJ OR at the Facebook mirror for this entry with a link to the piece you'd most like a print of. I will give away two in each place. 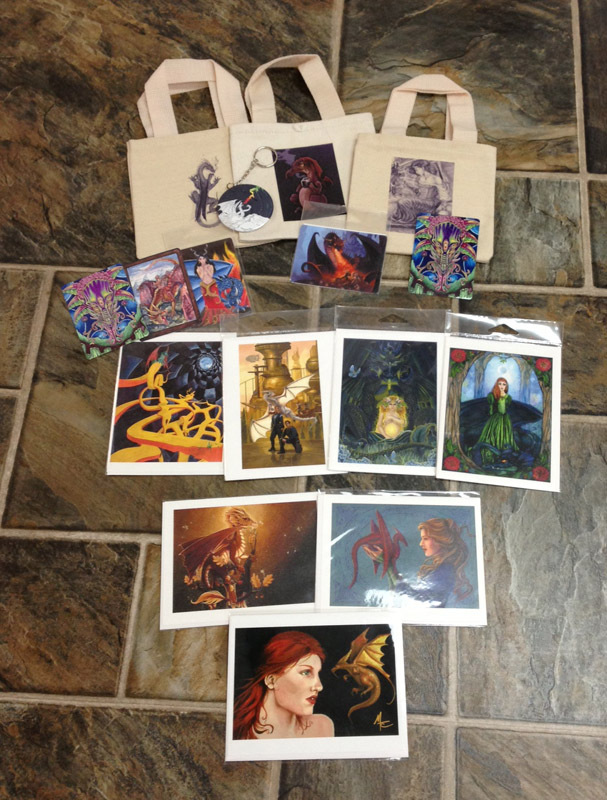 You may enter in both locations and may even win two of them (You may choose a second piece of artwork if you win both)! You may enter until Sketch Fest ends tomorrow at noon (4 PM EST). I expect these to go quickly... and I'd like to give multiple people a chance at them, so please choose just one to start with! If there still any left tomorrow, you can claim a second or third. You can place a claim anywhere - Facebook, LJ, etc, but it will be by first come/first served, and Facebook is sometimes flaky about notifying me and is more difficult to figure out when things were posted, so LJ is much safer! 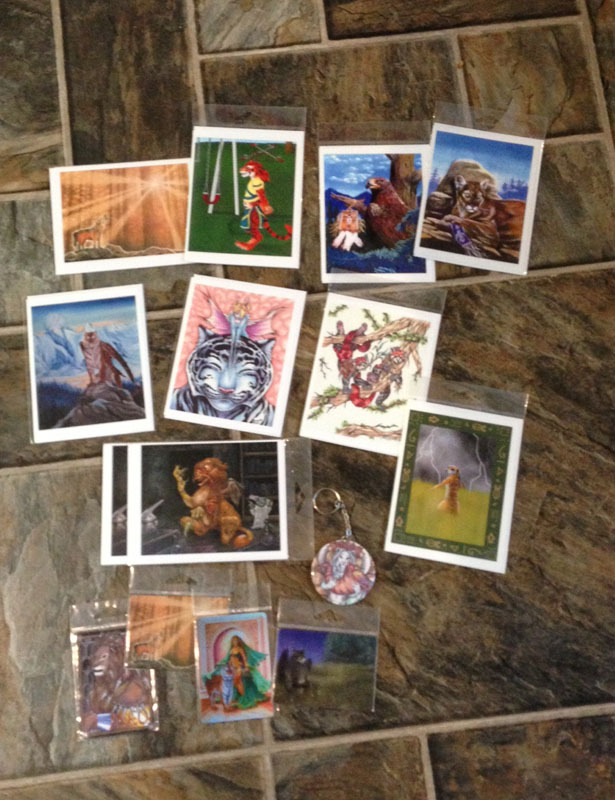 In 1995, I started offering postcards, and then cards through EMG. These were pretty unimpressive at first, just single-color ink on flecked gray cardstock. It was a few years before I moved into printing my own and offering color. I later re-did this design in a more square format for cards. And much later, I painted it again in oils. My sister has that painting hanging in her house. I am not done with this design yet. I think I've got at least one more in me. Now, someone small is insisting I read to her, and we both need some lunch! 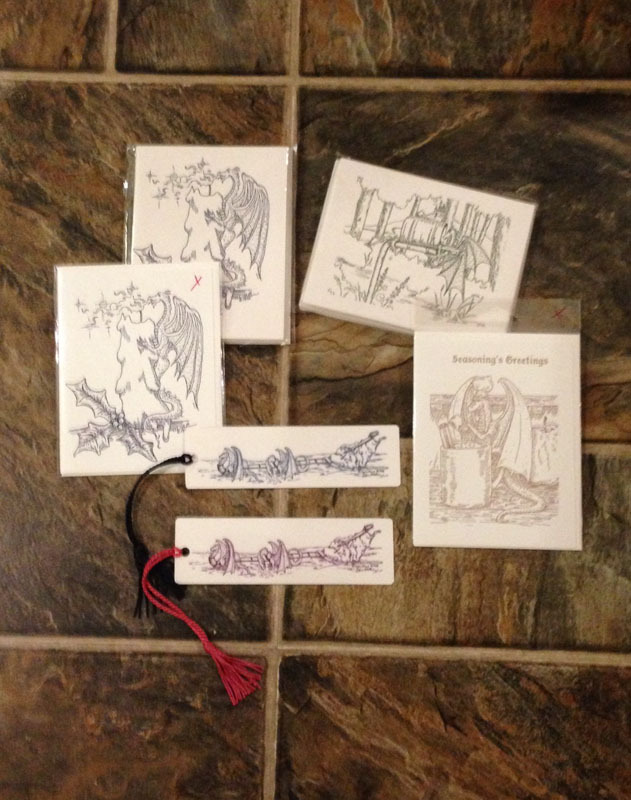 20 Days of 20 Years of EMG: EMG-Zine anthologies and a cat bundle! Since I'm renewing the EMG-Zine.com domain today, it seemed appropriate to feature the anthologies. 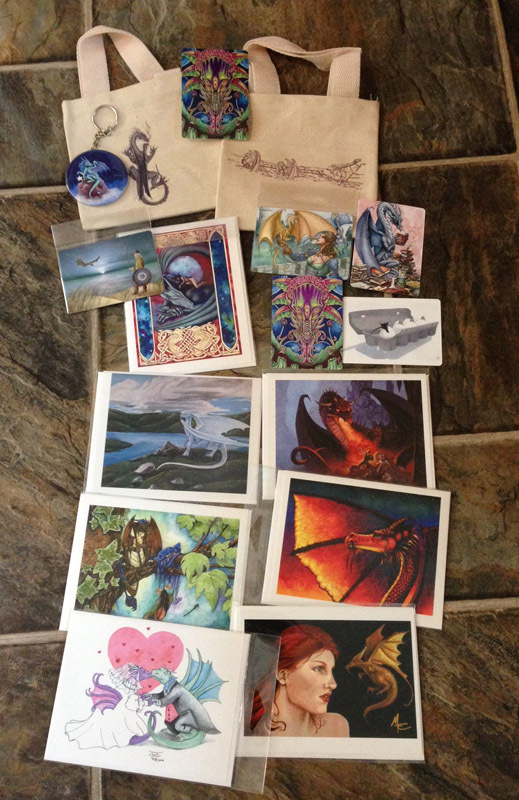 Some of the best of the first three years of the 'zine, these books are just STUFFED with useful advice, gorgeous art, and personal anecdotes about the art of the business of fantasy art (and writing). Humorous and deeply insightful, these books are a must-have for anyone starting out in the business. 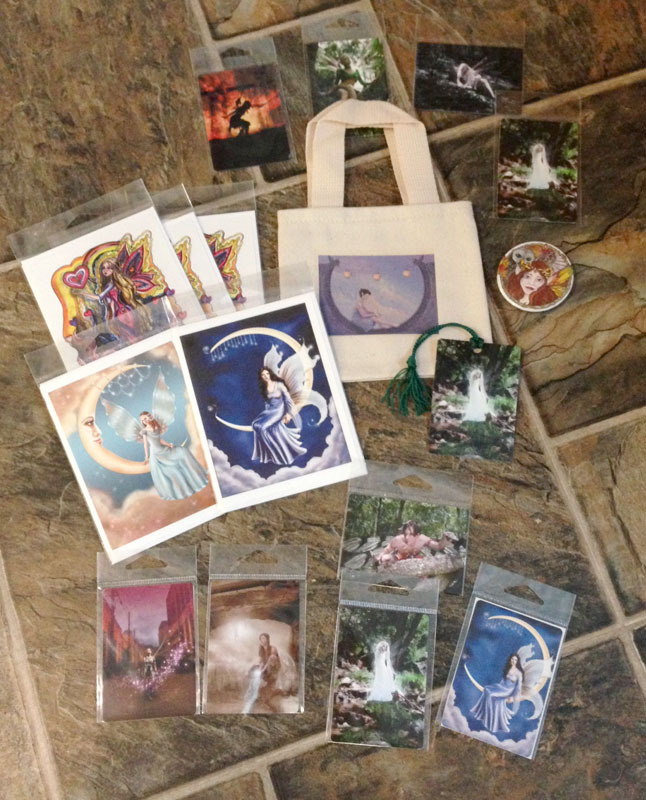 We also have one merchandise bundle for today! 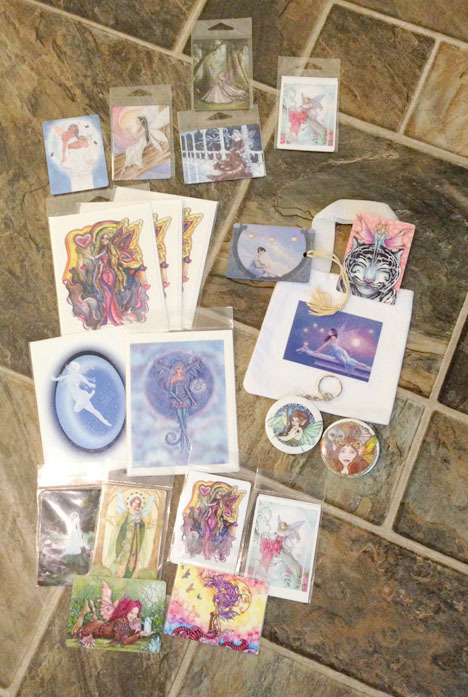 Cats Bundle: $15 (6 stickers, 2 magnets, 3 mirror-backed keychains and a button) Gone! 20 days of 20 year of EMG: More bundles, and calendar sales! 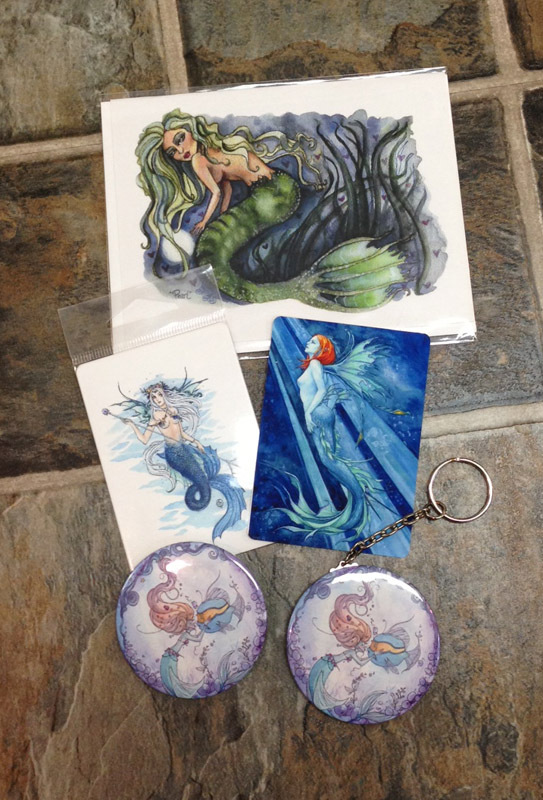 Mermaids Bundle: $10 (1 card, 2 stickers, a keychain and a button) Claimed! And today, we're looking at calendars! I had fun with calendars, but the biggest problem with them... they expire. No, they don't go BAD, but almost no one WANTS one after a few months into the listed year. So, they take up a lot of space in storage because I can't bear to throw them out, and later I try sell them for far, FAR less than I paid for them. I... would like to be rid of these, so I am offering them for $5 apiece, 2/$7, 3/$8, 4/$9 or 5/$10. Need a bunch for an art project? Avid collector? How about 10/$12! That's the equivalent of 120 prints. You can't beat that with a stick. Shipping is flat rate priority and about 5 fit in a flat rate envelope. I can stuff about 30 in a large flat rate box; I will hold and combine with other sales this month unless you request otherwise. 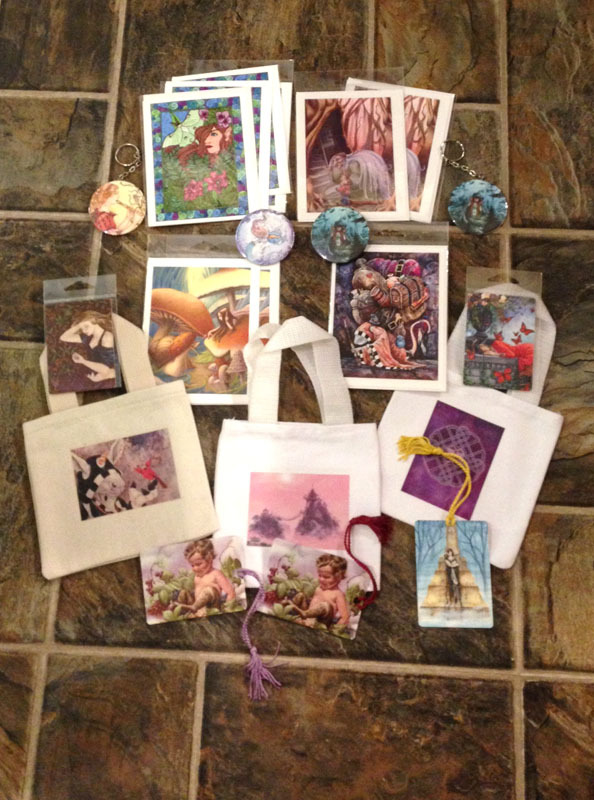 So I took myself (and Guppy) out to our storage box to see if I had any leftover EMG goodies I could tuck into orders this month - and found an unexpected treasure trove of cards, keychains, mini-totes, pins, stickers, magnets and more (and yes, tea!)! Some of them are best selling designs that are still not punched out. 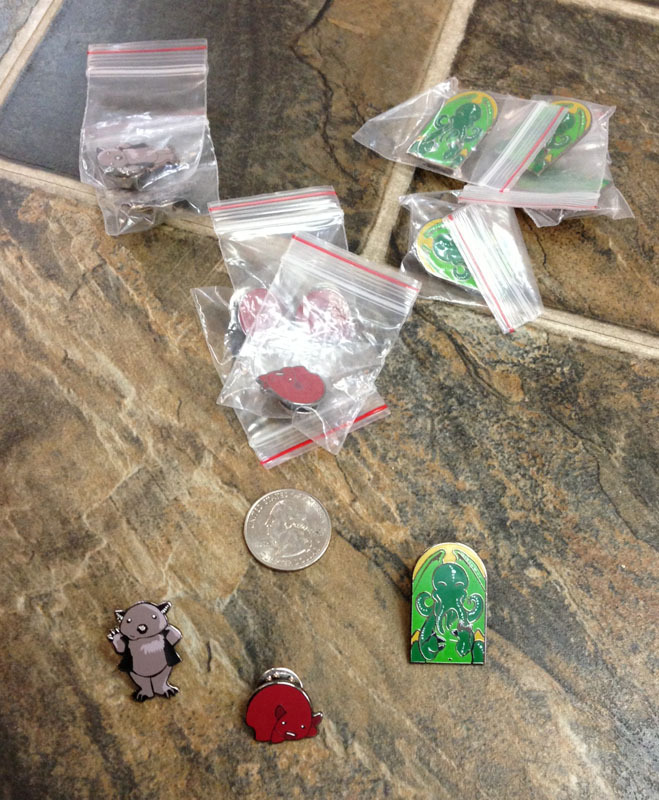 They are all in prime condition, most of them packaged for display, a few of the keychains are a little shopworn. 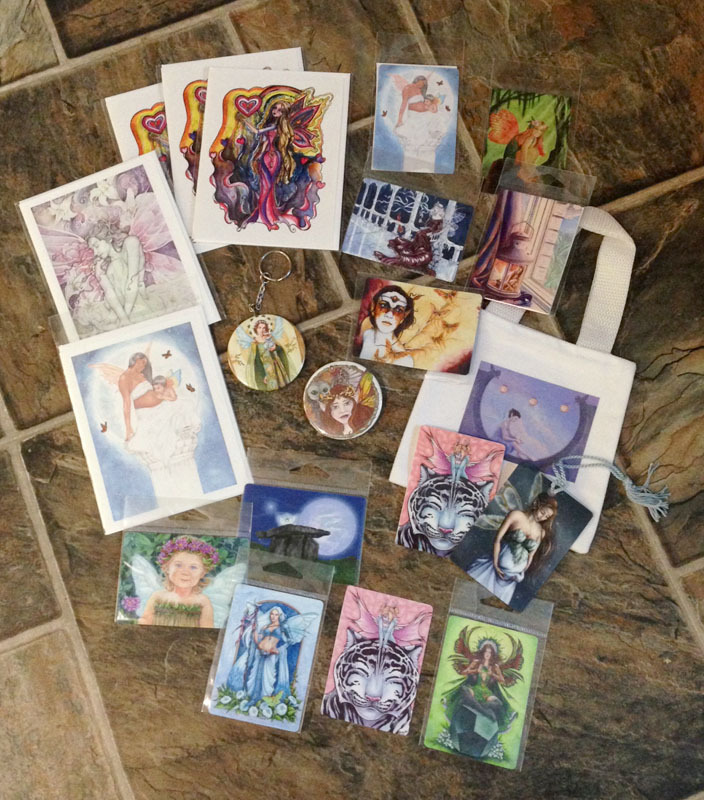 All artists were paid wholesale rates on these items when I packed them up for my big shop shut-down. Most of this artwork doesn't seem to be available anywhere anymore! 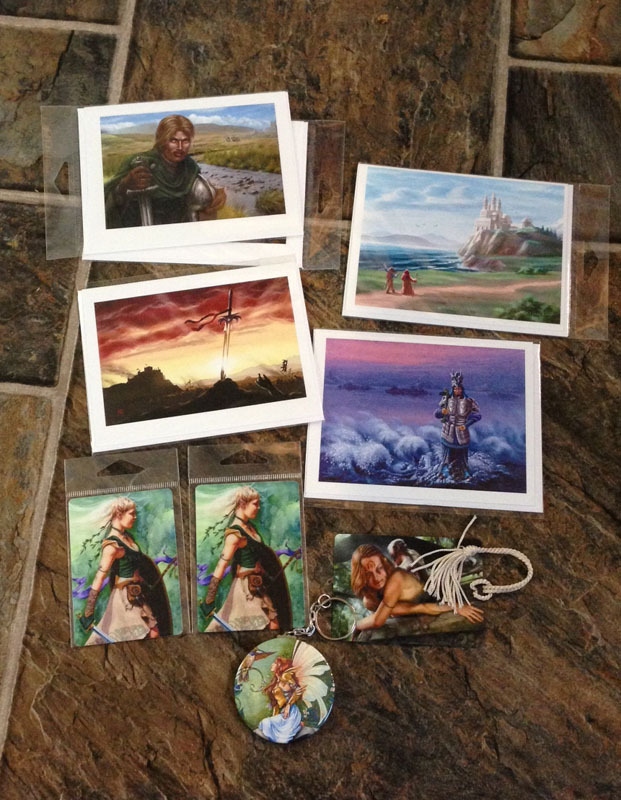 I've sorted them into themed bundles, and am letting them go at serious fire-sale rates, first come, first served. I will be releasing bundles most days this month, and all of them will be packed up and mailed early next month - unless you request otherwise. Click the photos for a larger images. TEA: The teas are high quality pyramid sachets, 20 to a tin. Available flavors: Peppermint (6), apricot/peach green tea (4 - I never carried these, I was planning to introduce this flavor! SO yummy! ), oolong (1) and chai (0, labeled). UNLABELED (unless noted). $6 each. Portrait Adoption special: half off all portraits in Ellen Million's gallery! Additionally any time you add any portrait (any artist!) to your wishlist, it counts as an entry in a drawing for a FREE adoption (from Ellen's available portraits!)! Calendars: $5 apiece, 2/$7, 3/$8, 4/$9 or 5/$10. Need a bunch for an art project? Avid collector? How about 10/$12! That's the equivalent of 120 prints, or about 10 cents per print. You can't beat that with a stick. Shipping is flat rate priority and about 5 fit in a flat rate envelope. I can stuff about 30 in a large flat rate box. 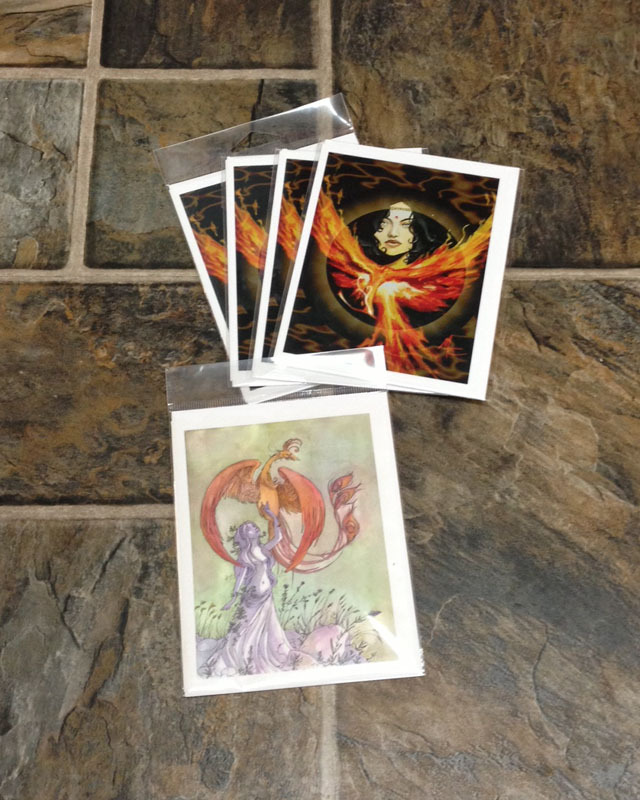 Special anniversary bundle, all 3 print copies ($72 value) just $50! !